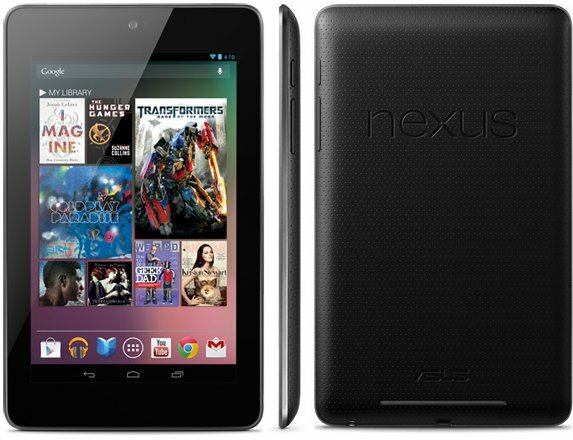 Google officially announced the Nexus 7 tablet at the company's I/O 2012 conference. This 7-inch tablet is the first device to feature Android 4.1 "Jelly Bean", it's manufactured by ASUS and features NVIDIA's Tegra 3 quad-core SoC. The IPS-based LCD display offers a 1280 x 800 pixel resolution, there's a 1.2MP front camera, NFC, WiFi, Bluetooth, micro-USB connectivity, and a battery life of up to eight hours for "active use" (nine hours for video playback). The Nexus 7 weighs 0.75lbs (340g) and is just 0.41" thick. You can pre-order the tablet at Google, it's available with 8GB and 16GB of flash memory for $199 and $249, respectively. Both models come with $25 of Google Play store credit, a free film (Transformers: Dark of the Moon), and some other free content.